Lawrence Kramer The problem of meaning stands at the forefront of recent thinking about music. Whether music has meaning, what kinds of meaning it may have, and for whom; the relationship of musical meaning to individual subjectivity, social life, and cultural context--these questions have inspired strong feelings and sharp debate. All of them undergo a fundamental transformation in Musical Meaning, which draws on a broad range of concepts and examples to rethink both how the questions are asked and how they are answered. The book starts from the premise that the problem of musical meaning is not just an intellectual puzzle, but a musical phenomenon in its own right. 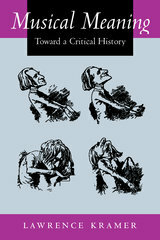 Focusing on the classical repertoire from Beethoven to Shostakovich, but also addressing jazz, popular music, and film and TV music, Musical Meaning uncovers the historical importance of asking about musical meaning, and above all of asking about it in and through music, in the lived experience of works, styles, and performances. The book celebrates meaning as a basic force in music history and an indispensable factor in how, where, and when music is heard. In the process, thinking about music begins to realize a potential rarely granted to it, that of becoming a vital means of thinking about general questions of meaning, subjectivity, and value. Lawrence Kramer has been a pivotal figure in the development of the controversial new musicology, integrating the study of music with social and cultural issues. This accessible and eloquently written book continues and deepens the trajectory of Kramer's thinking as it boldly argues that humanistic, not just technical, meaning is a basic force in music history and an indispensable factor in how, where, and when music is heard. Kramer draws on a broad range of music and theory to show that the problem of musical meaning is not just an intellectual puzzle, but a musical phenomenon in its own right. How have romantic narratives involving Beethoven's "Moonlight" Sonata affected how we hear this famous piece, and what do they reveal about its music? How does John Coltrane's African American identity affect the way we hear him perform a relatively "white" pop standard like "My Favorite Things"? Why does music requiring great virtuosity have different cultural meanings than music that is not particularly virtuosic? Focusing on the classical repertoire from Beethoven to Shostakovich and also discussing jazz, popular music, and film and television music, Musical Meaning uncovers the historical importance of asking about meaning in the lived experience of musical works, styles, and performances. Kramer's writing, clear and full of memorable formulations, demonstrates that thinking about music can become a vital means of thinking about general questions of meaning, subjectivity, and value. In addition to providing theoretical advances and insights on particular pieces and repertoires, Musical Meaning will be provocative reading for those interested in issues of identity, gender, and cultural theory. This book includes a CD of Kramer's own composition, Revenants: 32 Variations in C Minor, which he discusses in his final chapter. Lawrence Kramer is Professor of English and Music at Fordham University and the coeditor of 19th Century Music. He is author of six books, including After the Lovedeath: Sexual Violence and the Making of Culture (California 1997), Classical Music and Postmodern Knowledge (California 1995), and Music as Cultural Practice, 1800–1900 (California 1990).